America’s colleges and universities prepare the nation’s young people for their future. Yet those same institutions invest in the fossil fuel companies that are profiting enormously from the carbon that’s going to wreck the climate. Bill McKibben, founder of 350.org, hopes that together we can break the stranglehold the fossil fuel industry has over our democracy and our economy. Thousands of students are building a national movement demanding that university endowments divest from the fossil fuel industry. 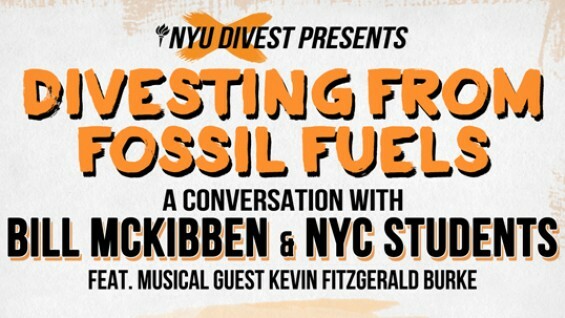 The event will feature a talk about divestment by climate change author and activist Bill McKibben followed by an open conversation with a panel of NYC student leaders. Join us in a unique opportunity to further explore why and how we should move our institutions forward to divest from fossil fuels. Musical guest Kevin Fitzgerald Burke will perform his inspired piece “Wandrin’ the Gasland”. By coming together within the NYC community, we can move forward towards powerful collective action. It’s time to write a new chapter in the fight against climate change.